Our Natural Swimming Pool/Ponds are a chemical-free, low-maintenance alternative to traditional chlorine or salt pools. The water is clean, crystal-clear and filtered naturally using a built-in biological filtration system. Instead of dumping toxic (and expensive) chemicals into a sterile, chlorine pool each summer, surround yourself with the beauty and tranquility of nature (and enjoy it all year round). Let our experienced design & build team help you to create the Natural Swimming Pool/Pond of your dreams and swim as nature intended it! No need to cover a Natural Swimming Pool/Pond during the winter: You can even go ice skating! Have you ever seen how many pounds of chemicals go into a typical swimming pool? Have you ever read the warning labels on the chemicals used to sterilize typical swimming pools? The basic philosophy behind water quality in a typical swimming pool is to kill everything short of killing the swimmer. There is another way. Visualize this: You are lazily floating, toes up, in a pond of sparkling clear running water, surrounded by wild grasses. Hummingbirds land on nearby trumpet flowers and the scent of jasmine and mint is in the air. Is this a dream or some mid-day fantasy? Neither! You may just be part of a new trend in swimming the natural way, without chlorine or other harsh chemicals in the water. In our Natural Swimming Pool/Ponds we harness nature's own processes, with powerful built-in biological filters, to produce clean, clear water. If you have ever had the opportunity to swim in a crystal clear lake or stream, then you know the sense of bliss that only nature can supply. Swimming is much more enjoyable without burning eyes and chemical odor. Plus, our NSP's are pet, fish & kid friendly! In Europe they have built hundreds of chemical-free swimming pools since 1985. Interviews with pool owners have shown overwhelming satisfaction. We have tested and swam in pools by Bio Nova and BioTop (leaders in the European NSP market). Their systems work well when water temperatures are cold (colder than 25 degrees centigrade). We have developed a system for much warmer climates (like that of the USA) using powerful, built-in biological filters (much like an industrial-sized aquarium). From Canada to Mexico, our system is biologically safe and will pass the bathing water standards in your area. In our most popular model, the swimming area is separated from the planted, built-in biological filter area with an underwater retaining wall. A waterfall offers pleasant music and valuable aeration, a pond skimmer collects large debris and the jet system keeps water moving. A pebble beach and wooden pier (w/ ladder) allow you to safely enter & exit the swimming area. ​For more details about this process and a guide to building your own chemical-free swimming experience, check out our eBook, Natural Swimming Pools & Ponds: THE TOTAL GUIDE, 2nd Edition. We also have pre-drawn construction plans for a basic NSP, our Essential NSP Plans (which come with their own copy of our eBook), available for purchase & download, right here on our website! Want a NSP that's tailored to your site-- something with some serious wow-factor? We have a variety of Custom Design & Build services available for both homeowners & industry professionals. For almost 20 years, our experienced design and fabrication team has created NSP's for folks all over the country: We travel & are ready to help you make your NSP project a success! Watch videos of our Natural Swimming Pool/Ponds in action on our Blog or Youtube Channel. ready to Start Swimming Naturally? Though Total Habitat is widely known today for pioneering the Natural Swimming Pool/Pond system in North America, we actually began as a Zoo Exhibit Design & Fabrication company back in the late 1990's. After building an otter habitat and watching them joyfully swim about in the crystal-clear water of their exhibit, we thought, "we need to do this for humans!". 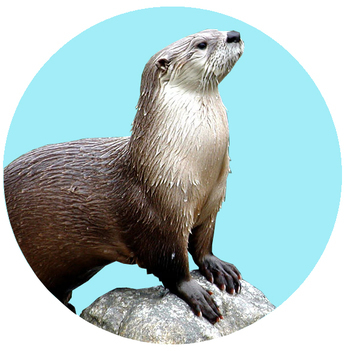 After building an otter habitat and watching them joyfully swim about in the crystal-clear water of their exhibit, we thought, "we need to do this for humans!" Though chlorine-free swimming pools and ponds were already in use in parts of Europe at the time, our challenge was to create a system that would reliably work in not-so-temperate climates like those of the United States, Canada, Mexico, South America, and beyond. Using knowledge gained from our years of experience in the Zoo and Aquarium industries, we studied all things water and water filtration, drawing from biology, chemistry, and the waste water treatment industry. Our Natural Swimming Pools use a built-in biological filtration system that is specifically engineered to handle a wide range of climates; from mild to fridgid, and from tropical to the dry, hot desert. Guided by scientific principles, we developed formulas for calculating our biological filter size for pools and ponds in any given area of the Country, based on factors like temperature zone, wind and sun exposure, fish population, and the number of gallons we need to turn over through the system each day. The result of these formulas gives us our biological filter size in linear feet, which allows us to place our filter system just about anywhere in and around the pool. That's why we don't need separate ponds or large "regeneration" areas-- we can build our biological filtration system right into the walls and/or floors of our Natural Swimming Pool/Ponds! Over the years, we have refined our techniques, honed our design and construction skills, and even wrote an eBook on the subject (now in it's second edition)! 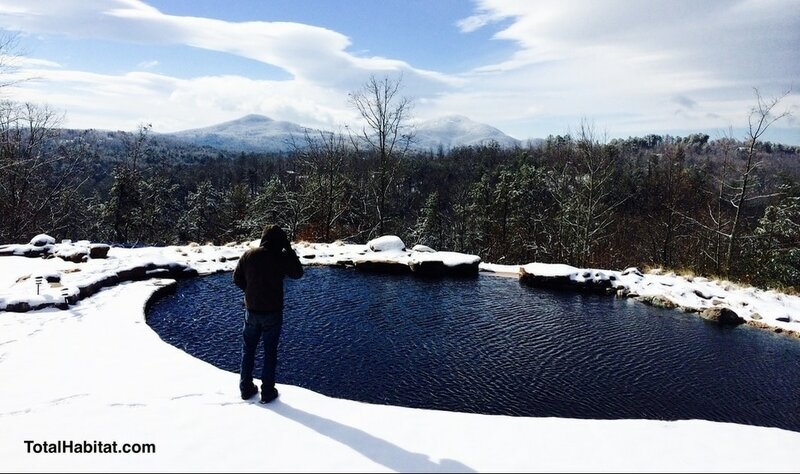 We have time-tested Natural Swimming Pool/Ponds (some over a decade old) across the United States, from Vermont to the Southern tip of Florida, from the high mountain desert of New Mexico to the rugged rocky mountains of Montana! Over and over again, tests of our Natural Swimming Pool/Ponds reveal crystal-clear water and thriving populations of beneficial bacteria that strip the water of nitrites, nitrates, E.coli, planktonic algae, skin and body oils, fish food and fish waste. 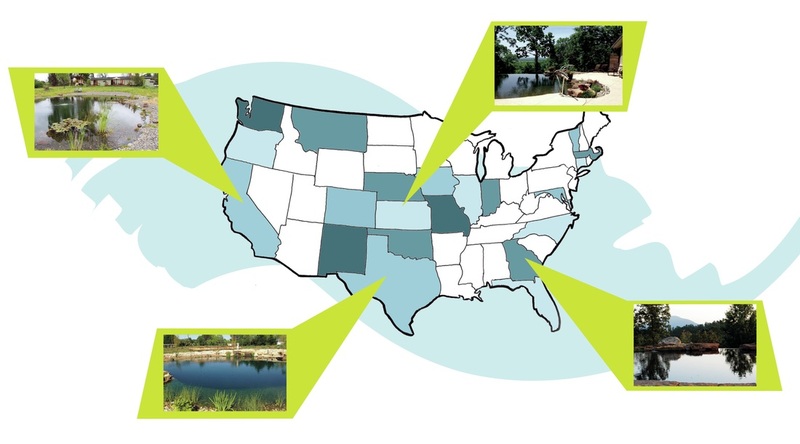 Though it continues to amaze even us, our spectacular water quality should really come as no surprise: In our Natural Swimming Pool/Ponds we are simply harnessing nature's own processes and adapting that system to work time and time again, for folks all over the US and beyond! 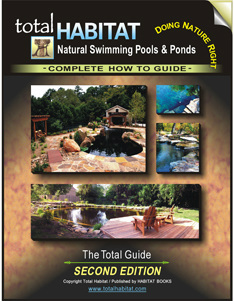 Click here to buy our eBook, Natural Swimming Pools & Ponds: THE TOTAL GUIDE, 2nd Edition. Our newly updated eBook has all you need in order to understand how the system works and how to create a NSP of your own! Our new edition is packed with detailed information, formulas, and over 80 illustrations, photographs, and Step-by-Step examples. Learn the concepts and design your own Natural Swimming Pool or Pond confidently! Click here to see Sample Pages of our eBook, Natural Swimming Pools & Ponds: THE TOTAL GUIDE, 2nd Edition. Have a question? Want to learn more? Then check out our Natural Swimming Pool & Pond FAQ page! Ready to create the Natural Swimming Pool or Pond of your dreams? Click here to explore the possibilities and form a plan that fits your needs as well as your budget! Check out our Blog and stay up-to-date on Total Habitat news, Natural Swimming Pool/Pond tips & tricks, step-by-step how-to guides, new project pics and videos! See this page of our website for NSP Safety & Liability disclaimers. Get the essential guide to creating our most basic, most affordable Natural Swimming Pool/Pond (NSP)! Now you can get the Essential NSP Plans and our how-to eBook, Natural Swimming Pools & Ponds: THE TOTAL GUIDE, 2nd Edition all for one low price! In the plan pages you will find detailed, scaled drawings of the NSP and all of its major components, including the biological filtration system (made from off-the-shelf materials), plan & section views of the NSP, wooden jumping pier, simple wooden ladder, underwater bio-filter retaining walls and optional waterfall/edge geology.